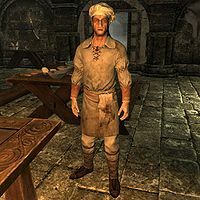 Odar, a Nord citizen, is the cook at the Blue Palace in Solitude. He is quite unconcerned with politics and is content to just be a cook. He sleeps with the rest of the staff in the chambers behind the kitchen between 8pm and 6am and always starts the day with a two-hour breakfast. He spends the rest of the day strolling around the kitchen. The only exception to this routine happens upon completion of Tending the Flames when he will visit the courtyard outside the Bards College every day between 1pm and 4pm. He wears a chef's tunic with a matching hat and a pair of shoes. He carries a spare belted tunic, an iron dagger, and a selection of common items and gold. When approached he will be quite happy about his own cooking skills, saying, "Jarls come and jarls go, but a good cook stays for a lifetime. And I'm a very, very good cook." but will admit he is rather anonymous in the palace: "Most of the time, people just forget I'm even here. That's why I hear so much good gossip." He will readily reveal his personal stance on the palace hierarchy with "Everyone knows General Tullius wields the real power Solitude [sic]. Elisif? Ah, she's a figurehead. A puppet." He will continue to say this even if Tullius is dead. He will also randomly share a few opinions on court wizard Sybille Stentor, "Folks at court won't admit it, but Sybille Stentor scares us all to death." and "Somethin' just ain't right about that Sybille. You know, I've never seen her eat a thing? That can't be natural." When you leave conversation he will just add, "All right. Back to slicing, dicing and baking." or "Back to my errands." This page was last modified on 5 November 2014, at 14:21.